(Barcelona, Spain)- This year’s J/80 European Championship is being sailed off the beautiful coastline of Barcelona, site of the 1992 Olympic sailing events. The regatta is organized by CN El Balís, the Spanish and Catalan Federations and the Spanish and International J/80 Associations. The event is supported by the General Secretary’s Office of Sports of the Catalan Government, the City Hall of Sant Andreu de Llavaneres and Spain’s National Sports Council. Starting this Saturday, June 28th, the fifty-three teams entered will sail for one week, with 2-3 races per day planned. Many of the best teams from across Europe are sailing, with teams coming from far and wide to test themselves against the powerful Spanish fleet. There are 20 Spanish team, 22 French teams, 5 British teams, 2 German, 2 Swedish and 1 each from Italy, The Netherlands, Oman, Poland and Russia- a total of ten nations represented. The Swedes have two of their best teams in the mix, Mikael Lindquist’s ROCAD RACING and Lars Gellerhard’s MK-PRODUKTER. From Russia is Andrey Samoylov from the Pirogovo Sailing Club; from Poland is Pawel Boksa on MOONRAKER; from OMAN Sail is Rajaa Al Uwaisi on AL THURAYA; from the Netherlands is Laura Vroon’s JOIE DE VIVRE; from Italy is Massimo Rama’s JENIALE! ; from Germany are Sven Vagt’s CAMPAIGN and Bjoern Beilken’s PROCEDES DIVA; and from Great Britain are Patrick Liardet’s AQUA-J, Jon Powell’s BETTY, Mike Lewis’s JESTER and Dr Gillian Ross’s TEAM ROCK & ROLL. What is very apparent for this event is that Team France have brought along all their “big guns” and then some. Virtually all the top boats that are leading the Coupe de France J/80 are in attendance, including Matthieu Solomon’s EV CATASCHOOL, Alexis Henri’s VOILE AMBITION DUNKERQUE, Eric Brezellec’s COURRIER JUNIOR, Maxime Rousseaux’s J’RAFON (a top woman skipper), Simon Moriceau’s INTERFACE CONCEPT, Luc Nadal’s GAN’JA, and Simon Fabrice’s MARINE CHERBOURG DCNS. The powerful J/80 Spanish fleet has clear possibilities to reach the top three places in the regatta. A clear favorite is FACTOR ENERGIA skippered by Barcelona 1992 gold medalist José María van der Ploeg. Other top Spanish teams include Hugo Rocha on NEW TERRITORIES (the 2013 J/80 World Champion in Marseilles, France), Marc de Antonio’s BRIBON-MOVISTAR, Javier Shercks’s GUNTER and Carlos Martinez’s DELTASTONE (another J/80 World Champion). (Sydney, Australia)- For those of you looking for some fun “Down Under” winter-time activity, be sure to swing by the Sydney International Boat Show from 31st July to 4th August to see the latest J/70 and J/111 on display. The Sydney Show is located at an exciting new location at the Sydney Exhibition Centre at Glebe Island on Johnstone’s Bay, a fully functioning exhibition facility designed to accommodate world class exhibitions. In addition, the spectacular Cockle Bay Marina at the base of Darling Harbour, always a show highlight, remains on its traditional site. There is a free ferry that connects the two sites, both situated on picturesque Sydney Harbour. J/133 Sailing Video Off Norway! (Brekstad, Norway)- We recently got a note from Fredrik Lundh, a crew member of the J/133 J-WALK 2, that has been sailing for the past few years in the Baltic, the North Sea and parts even farther north. This year, Fredrik’s J-WALK 2 sailed in the annual Halten Ocean Race from the city of Brekstad to a course north around the Halten Lighthouse - approximately 150nm in length— this race is sailed on the open North Atlantic Ocean on the west coast of Norway, just a few dozen miles south of the Arctic Circle! Her owner Arne Rathe skippered J-WALK 2. The race was hosted by the Yacht club in Trondheim (TSF)- yes, the famous fjord near the southern tip of Norway. (San Diego, CA)- Racing at San Diego YC this past weekend in J/22s, 20 year-old Ryan Davidson, sailing for Balboa Yacht Club, swept the field representing seven other yacht clubs to take the US Match Racing Area GHJL Qualifier #2. 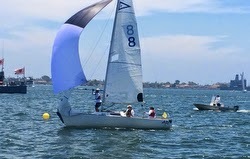 Ryan now advances to the finals, also being held in J/22s, at St. Francis YC in early October. Ryan and crew Brandon Folkman and Gregg Kent turned in a flawless two days of match-racing, finishing 14-0. In addition to outperforming his opponents in tactical match-racing maneuvers, Ryan avoided mistakes in the pre-start and accurately called pressure up the course to lead almost every match wire-to-wire. Relatively consistent winds of 8-10 kt and flat water rewarded straight line boat speed and two Bay Area teams, John Horsch from Treasure Island Sailing Center and Nicole Breault from St. Francis Yacht Club, were just plain fast, out-sailing the rest of the field (except for Davidson) and tied for second, at 10-4, with Horsch winning the tie-breaker. His team consisted of crew Amy Daniel and Karina Vogen, while Molly Carapiet, Jen Glass and Hannah Burroughs sailed with Breault. The diverse field of competition revealed the upsurge in interest for match-racing on the West Coast, including Hawaii, whose Waikiki YC sent a team, alongside Balboa YC, Treasure Island, St. Francis YC, Newport Harbor YC, Del Rey YC, California YC, San Francisco YC, and San Diego YC. US Match Racing Area GHJL representative Bruce Stone reported that both qualifier #1 and #2 had the required number of international umpires and competitors from over 500 km away so they could qualify as a Grade 3 event, rewarding the top skippers with additional ISAF ranking points. San Diego’s regatta chair Summer Greene, together with the St. Francis, received around 24 formal applications or serious inquiries for the available 16 slots, leading to the possibility of staging a third West Coast qualifier in 2015 at another venue. (Long Beach, CA)- One of the long-standing classic sailing weeks on the California racing calendar has been Long Beach Race Week, taking place this week from June 27th to 29th. With many one-design classes and a number of offshore classes, the event provides a mix of sailing that is unique in the SoCal region. While one-designs may be doing the standard windward-leewards, the offshore boats have a choice of “random-leg” courses or the basic buoy-racing like the one-design boats. The mix of classes and types of racing continues to attract many sailors to the event, with 139 boats participating this year. Long Beach YC does a fantastic job of rolling out the red carpet (particularly around their famous pool right on the harbor) and host a lot of fun, entertaining events every evening. In addition, LBYC’s volunteer crew of Race Committee’s and PRO’s do an admirable job of getting races off in just about any weather condition. For the J/70s, it’s their first West Coast Championship and sixteen teams will by vying for some of the last qualifying slots in the 2014 J/70 Worlds in Newport, RI. With three boats each from San Francisco Bay and from San Diego and the rest from the Los Angles basin (Santa Barbara YC, Cal YC, Kings Harbor YC, Balboa YC and Newport Harbor YC), the fleet will enjoy some close racing amongst some very experienced J/70 teams. In fact, there are two year veterans already from the first Key West Race Week participating- David Ullman on USA 32 as well as Bennet Greenwald sailing PERSEVERANCE. While they will be tough contenders, there’s no question several other J/70 teams have climbed the learning-curve quite quickly in this easy-to-sail one-design speedster. Amongst those teams are SOGGY DOLLAR (Dave Vieregg), ZUNI BEAR (Rich Bergmann), JENNIFER (Chris Kostanecki), SLOOP JOHN B (Tom Garrett), ZERO TO 60 (Karl Pomeroy), PERFECT WIFE (Chris Andersen), GO-RILLA (Dan Gribble), CAKE (Scott Deardorff) and JAYA (Craig Tallman). With seven boats, the J/120s are well-represented with teams from all over Southern California. Virtually all of them have been winners or on the podium in the last year or so, including CAPER (John Laun), J-ALMIGHTY (Mike Hatch), SHENANIGANS (Gary Winton), JIM (John Snook), CC RIDER (Chuck Nichols), POLE DANCER (Tom & Terri Mock) and ADIOS (Peter Bretschger). The eight boat J/24 class has seen a significant resurgence in participation with several top teams in the mix, past West Coast Champions as well as North American Champions. 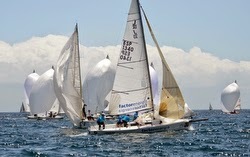 Topping the list may be Pat Toole’s 3 BIG DOGS Team from Santa Barbara YC. Nevertheless, top local team, Susie Taylor on TAKE FIVE from California YC, will surely challenge them. The long-distance travelers must be Mike Johnson’s PEARL team from Seattle YC. 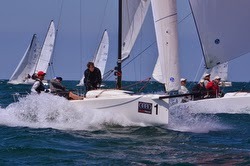 The J/80s will see returning champion Curt Johnson from Cal YC guiding the might AVET towards a defense of their title. Look for Steve Wyman’s Dana Point YC team on NUHUNU giving them a run-for-the-money as well as Mark Hunter’s IN-APPROPRIATE. The J/105s will see the return of two of SoCal’s top teams, including local talents Gary Mozer on CURRENT OBSESSION 2 and Rick Goebel’s SANITY crew from San Diego, the recent San Diego NOOD overall winners. While last year the SANITY crew seemed to have the upper hand in breezes over 10-12 kts, the tables may have shifted since the San Diego NOOD where SANITY won with over 7 bullets on their scorecard in light winds. The half-dozen J/109s have past winners Tom Brott on ELECTRA from Seal Beach YC as well as John Schulze from Balboa YC on LINSTAR. 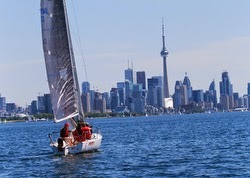 (Toronto, ONT)- This year’s Redpath Toronto Area Hospice Regatta was again hosted by the National Yacht Club along the beautiful Toronto waterfront. An excellent turnout of 46 boats not only assured the Toronto Area Hospice excellent fund-raising but also fun competition and camaraderie amongst the sailors in the six fleets in attendance. 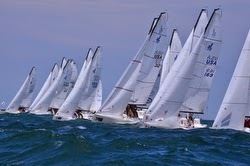 The event also marked the J/22 Ontario Provincial Championship. The sailors were blessed with three straight days of good weather and light to moderate winds. Taking advantage of their light-air speed was Jeff Love’s crew aboard the J/22 STAMPEDE. Starting off with three bullets, the “Stampeders” never looked back, amassing three more bullets and a third on their way to a convincing win in the J/22 Provincials, counting just nine pts in seven races! Behind them in second place was Stephen Jones, counting a 2-2-6-1-3-3-2 for 19 pts and in third was Geoff Bayne’s crew on THREE’S COMPANY scoring a 9-3-3-2-2-4-3 for 26 pts total. The balance of the top five was taken by Oleg Koubrak’s BESS in 4th and David Doyle’s INNOCENT BYSTANDER in 5th. Neither Tornado’s Nor Tumbleweed Stop Dallas Race Week! The World’s Best Honky Tonk “Pursuit Sailing” Regatta! (Dallas, TX)- With an event history going back to 1982, Dallas Race Week always bridges the week of Summer Solstice in June and is held on Lake Ray Hubbard. The founder of the event, Scott Self, wanted a week long regatta to always be in the evening so no one needed to miss work during the day. Scott’s son, Billy, has helped him organize the event for the past 10 years. The two have kept this event going for 33 years. 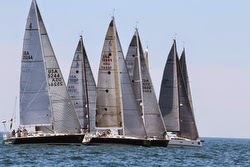 Dallas Race Week is a coordinated event between three yacht clubs located on Lake Ray Hubbard. Chandlers Landing YC, Bayview YC and Rush Creek YC. 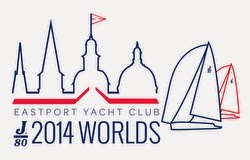 The schedule is one race per night at 7pm with a party each night at each yacht club. The race is a 5 mile point to point or around the lake format directed toward the 40+ PHRF boats actively sailing on Lake Ray Hubbard. It is the single event all year that the entire lake gets together to race and party together. The key to racing in Dallas Race Week is the pursuit start, which allows the slower boats to start first according to their PHRF rating, and for line honors to win the race. Dallas Race Week is a corporate sponsored sailing event benefiting community service projects of the Rockwall Breakfast Rotary Club. The mission is to provide funding for programs that address issues of poverty, hunger, illiteracy and health care affecting the community. The motto is “Sail Into Service” and it is a belief that represents the value placed on teamwork by sailors and community servants throughout history. The main sponsors this year are Gus Sails, The Matteson Realty Group and SailWithScott.com. For 2014, the event is challenged with extremely low lake levels causing the start/finish location to be equidistant from the three yacht clubs. The lake is 7’6″ below normal levels due to drought conditions in the southwest. The sailors have really embraced the situation to make the most of Dallas Race Week, with a modified format so the show goes on. Races are scheduled June 15 through 20. (The Hague, The Netherlands)- On the last day of the Delta Lloyd North Sea Regatta, only one race was sailed in all the fleets due to the light conditions, so all teamed headed back to shore to celebrate a week of good sailing amongst friends. Perhaps the two teams that were most excited of all were the J/122 JUNIQUE sailed by Chris & Dirk-jan Revelman and the J/22 sailed by the trio of Edens, Bart and Ewout- both teams winning their fleets by substantial margins. The Delta Lloyd North Sea Regatta starts with the two offshore races that the J/122 participated in, the Vuurschepen Harwich Race and the RORC North Sea Race. In both of those events, the fast-sailing Revelman’s guided their J/122 JUNIQUE to overall victory in the Double-handed fleet for the combined races. Their winning formula and remarkable performance continued during the week-long regatta, taking four straight firsts in as many races and not having to sail the last race to win by a substantial margin. A somewhat similar scenario played out in the thirteen boat J/22 one-design class for the North Sea Week one-design regatta. Starting out the regatta in the lead after the first day, the trio of Edens, Bart & Ewout simply sailed a much more consistent regatta than anyone else, only finishing out of the top three once in 10 races! In the end, the after two drop races, they counted only 14 pts total to win by 8 pts. Taking second place was the trio of Stephan la Grouw, Rosemarign, Tom and Gideon sailing TEAM COJONES with a total of 22 pts, just nipping out the FRAPORITA team (Jean-Michel Lautier, Guiseppe d’Aquino & Denis Neves) with 23 pts. 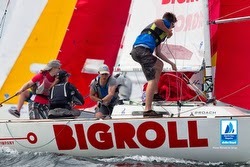 Taking fourth place was Team BIG ROLL- TU DELFT BERING sailed by Nova Huppes, Sanne Crum & Joost Schot with 29 pts. Fifth place was the trio of Frans Bianchi, Marcel Hanenberg and Divera Pronk with 35 pts. (Block Island, RI)- The even year Block Island Race Week, running from June 23rd to 27th, is an exciting event for racers who love competing in a week long series in Block Island Sound in the years between the Storm Trysail Club’s biennial event. Beginning in 2008 the Duck Island Yacht Club of Westbrook, CT has ably providing race committee and logistic support. 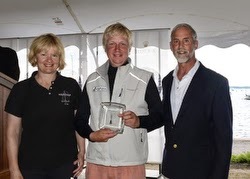 Even better yet, Sue Miller, a highly respected PRO (and former top Tufts University Jumbos sailing team member), will be ensuring the sailors get more than their fair share of excellent sailing in Block Island Sound. Answering the call to arms for this year’s event are J/109s in IRC Class, J/111s and two new J/88s in PHRF 1 and three J/29s and J/35 in PHRF 2. In fact, of the 24 boats sailing, 11 are J/Teams from across the Northeast. We find Bill Sweetser’s J/109 RUSH and Hugh McLean’s J/109 SHEARWATER up against tough customers like Ken Colburn’s championship winning Swan 42 team- APPARITION (many former top J/105 sailors from Marblehead, MA). 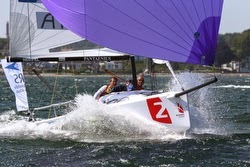 Another Swan 42 will be a factor in the running for the silver- Paul Zabetakis’s IMPETUOUS. The PHRF 1 class is just about over-run with good J/crews. 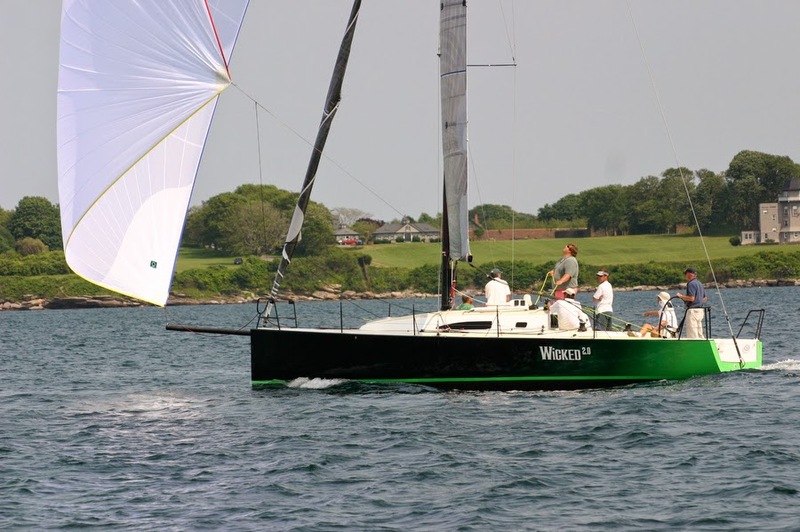 Doug Curtiss’s J/111 WICKED 2.0, a past winner of Block Island Race Week, will be hoping to return to the top of their class. Sedgwick Ward’s J/111 BRAVO is also aiming for the podium again. Certain to give these two boats headaches may be the twin new J/88s, Iris Vogel’s DEVIATION and David Betts’s INSTANT KARMA. Finally, John Forster’s J/92 SALTIRE will be working hard to keeping them all honest. 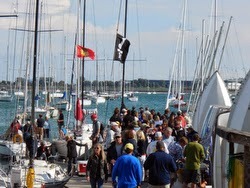 (Chicago, IL)- The 2014 edition of J/Day, sponsored by Skyway Yacht Works, Columbia Yacht Club and Stearns Boating is scheduled for June 28th 2014. The 2013 day was a great success, fighting crazy weather that included fog (in Chicago??) so thick you couldn't see 500 yards. The day turned into some of the most fun sailing of the summer. Once again, the sailing will be in the outer harbor right off the Aquarium and Planetarium. It will once again be crazy fun racing for all. For more information, please contact Rich Stearns (rich@stearnsboating.com) or Steve Kindra (ph# 847-638-0010 or info@skywayyachtworks.com). (Le Havre, France)- The French J/80 J/Cup Series continues their next installment with an extraordinary turnout of 35 boats at the famous Normandy Sailing Week. 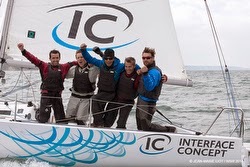 As they have demonstrated in earlier regattas, the team of Simon Moriceau on INTERFACE CONCEPT have established a strong lead in their season long offshore series by securing a profound performance in the Normandy Regatta. 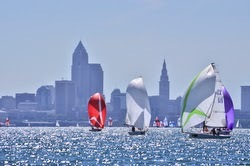 J/One-Designs Love Cleveland Race Week! (Cleveland, OH)- Dozens of one-design boats invaded Cleveland Race Week at Edgewater Yacht Club in Cleveland, Ohio from June 13-15. 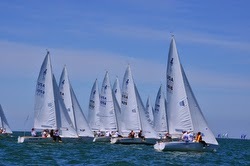 Eight fleets competed, including 25 J/70s duking it out for the Great Lakes Championship. Fortunately, the J/70s began their series on Friday, which featured northwest breezes in the teens and typical Lake Erie waves. Winds started strong again on Saturday morning when all fleets got in on the action, but died off throughout the day. Sunday dawned with light breeze but increased, making for a beautiful day of racing in Cleveland. The Race Committee ran three separate circles and was able to complete up to 11 races on certain courses. For the twenty-five J/70s, it was Paul Hulsey's TEAM BAYVIEW that handily won the 10-race series with 49 points to be crowned the 2014 Great Lakes J/70 Champion. The Corinthian team beat out Henry Filter's WILD CHILD and Paul Cannon in second and third, respectively--both with 62 points. The fifteen boat J/22 class saw the New Yorkers take the top two spots. 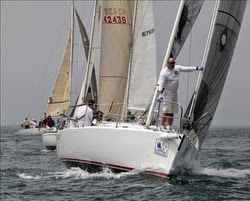 The MO’MONEY team of Vic Snyder/Kevin Doyle from Youngstown Yacht Club had just 17 pts in six races to win their class. Second was RJ Moon’s crew on AXE WOUND from Rochester YC snatching defeat from near certain victory, posting a 2-10-6-1-1-3 tally for 23 pts (bet they would pay anything to get back the 10th!). Third was Dave McBrier’s VAMANOS/ HARDWARECHIMP.COM team from Erie YC with 26 pts. 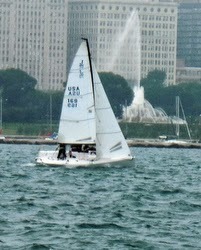 The J/24s were taken by the BLACK & TAN crew led by Erie YC’s Steve Hronek with 9 points in 6 races. In fact, they won on a tie-breaker over Chris Glynn’s crew on THE MYSTERY MACHINE by virtue of winning the last race. Third was Terence Bowdish’s CARRY ON. 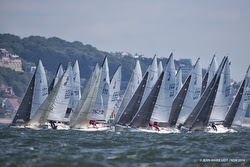 (Annapolis, MD)- “Uniquely situated on the Severn River at the mouth of the Chesapeake, Eastport Yacht Club is eagerly anticipating the J/80 world championship this fall. Top notch Race Committee led by Principal Race Officer Sharon Hadsell, NRO (USA), a representative International Jury with Charlotte Greppe, IJ/IU (SWE) as Chief Judge, professional staff and volunteers experienced with running large scale world class events are all ready to welcome you to a guaranteed excellent regatta,” commented regatta Co-Chairs Sharon & Jeff Borland. The Worlds committee has released the cool-looking logo (seen here), and is working on creating great merchandise with it. Preparations are under way for some great parties to celebrate a great class. Music, food and the famous Eastport hospitality will be sure to impress! Both on and off the water, this will be a World-class event! The first measurement weekend has been announced as July 12 & 13, in Annapolis, MD. The Worlds committee measurement team, overseen by a certified J/80 class measurer, will be weighing boats and doing hull and keel checks. The weights will be certified and the boat will not have to be weighed for the North American championship or the World championship. Only boats that are registered for the North Americans and/or Worlds will be measured during this weekend. Boats that are made available for charter on the official website may also be measured during this time. The J/80 Worlds Committee has pledged to become a “Clean Regatta” through the Sailors for the Sea’s Ocean Conservation program. The class is excited to step up to help conserve the waterways that the sport is dependent upon. Minimizing printed materials, stocking “green” supplies and non-toxic cleaning products, using refillable water bottles & separating recyclables from trash while racing, are just a few of the steps everyone can all take to run an environmentally friendly regatta. To read more, check out the press release here and the Sailors for the Sea website. 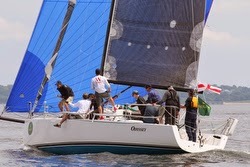 There are several good J/80 charter boats available- please contact charters@j80worlds2014.org for more information. (Newport, RI)- Light, shifty winds had an unusual stronghold on this year’s 160th New York Yacht Club Annual Regatta presented by Rolex, but most of the 189 teams competing knew how to take it all in stride. For many it was a test of patience. The tricky, occasionally windless, conditions for the Around the Island Race insisted on sticking around for the first day of the regatta, in fact, causing a postponement ashore before the fleet took off into a light SSW breeze for Saturday. Sunday dawned with a crystal-clear blue sky and lots of promise, a solid 10-15 kt cool breeze was flowing from the NW but that, too, ultimately died and switched into a light SSW breeze. To say that it was challenging for the NYYC PRO’s on all three courses (two outside on Rhode Island Sound and one in Narragansett Bay) would be an understatement. Nevertheless, most fleets managed to squeeze in one race per day to make it a series. The regatta traditionally starts out with the Around Conanicut Island Race, a 21nm circumnavigation that often makes good use of the steady southwest seabreeze that develops by midday. The course is usually clockwise, starting off Rose Island in the East Passage of the Bay, rounding Beavertail Lighthouse Bell “NR” to starboard, the Green can “5” and Red Bell “2” at the north end of the island, then a straight leg home to the finish just off Fort Adams. Perhaps for the first time in a half-century, the race course had to be shortened at the Jamestown Bridge center span, less than halfway through the race after starting south of the Newport Bridge! The fleet was caught sailing in a slow-moving front that was “spritzing” a nice cool, rainy mist with winds spinning around the compass from 0 to 5 kts max. Amongst the J/Teams that performed admirably in the simply maddening conditions were Chris Jones and Louise Makin from Hamble, England sailing the J/111 WILD CHILD, winning PHRF 1 class and followed by classmate Fred Van Liew and David Brodsky on their J/111 ODYSSEY in fourth. Other notable performances were in PHRF 2 with EC Helme’s J/92s SPIRIT taking third in class and Brian Kiley’s J/29 MEDDLER X taking fifth. In the IRC classes, Mike Bruno’s J/122 WINGS grabbed a fourth overall in IRC 4 while Bill Sweetser’s J/109 RUSH took second in IRC 5 class followed by Joerg Esdorn & Duncan Hennes’s J/44 KINCSEM in fourth. For the Annual Regatta that took place Saturday and Sunday, both the White Course and Green Course fleets were quite happy, in retrospect, to have at least counted two races as crazy as anyone may describe them. On the Green Course up Narragansett Bay were the PHRF Navigators classes. In PHRF 1, the J/111’s faired quite well with the Jones/ Makin team on WILD CHILD taking the class win with a 1-3 for 4 pts over the Van Liew/ Brodsky team on ODYSSEY with a 3-4 for 7 pts. In fourth was Doug Curtiss’s WICKED 2.0 with a 2-6 for 8 pts, losing a tie-breaker with another boat. Significantly, all three J/111s were 1-2-3 on Saturday’s race. In the PHRF 2 Class, it was a J/Team clean sweep. In fact, it was a bit of a “back to the future” experience to see the classic J/24 winning class. By virtue of their most excellent performance on Saturday, the J/24 NIGHTHAWK sailed by the trio of Barker, McVicker & Ryan took the class win. Second was EC Helme’s J/92s SPIRIT and third was Brian Kiley’s J/29 MEDDLER X. Outside in Rhode Island Sound, the White Course IRC classes saw for the third year in a row the J/122 WINGS sailed by Mike Bruno from American YC in Long Island Sound take IRC 5 Class with an impossibly low score of 1-1 for just 2 pts. Third was another classmate, the J/122 AUGUST WEST sailed by Jamey Shachoy from Buzzards Bay, MA. Rounding out the top five were Len Sitar’s J/44 VAMP in fourth and Paul Milo’s J/122 ORION in fifth. Another repeat winner in IRC 6 was Bill Sweetser’s J/109 RUSH from Annapolis YC in Annapolis, MD. RUSH scored a 2-2 for 4 pts to walk off with class honors against such notably famous boats like NYYC Vice Commodore Rives Potts’s CARINA. 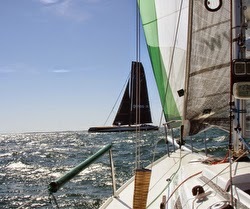 (La Trinite sur Mer, France)- “We should have been prepared for our participation in Spi Ouest. The Breton town, whose marina is larger than the town itself, lured 2,500 sailors and 408 boats to measure their skill together. 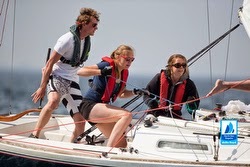 Where last year was a bit short on sunshine, we were prepared for fantastic weather for this year’s sailing spectacle. Every morning, an armada of racing yachts took off in a picturesque setting to get to the day’s sailing in the Bay of Quiberon. Next to us, and our 88 competitors in the J/80 class also sailed other boats in their respective classes. We had traveled with our "campaign" already for two weekends before the start of races and had used the time for training and testing sails. Impressively, we had an encounter with "Spindrift", the largest 130 ft. trimaran in the world, the fastest Atlantic crossing and sail around the world, at one of our training sessions. Races were scheduled for Friday to Monday. The J/80 class was divided due to their size into two groups, which were mixed again on the second day of racing. The last two days would be a "Gold Fleet" and the "Silver Fleet". Strengthened by our training we started for the first race. We quickly realized that the level in spite of the reduced number of participants was still damn high! At the end of the first day we were 39th place but climbed back into 16th place, and from there into 14th on the last day. One can be philosophical about results as much as you want, but what counts in the end is the fun on the water - and we had that! The Spi Ouest 2014 was a feast for sailors; the mood at night in the tents in the North Hall was second to none! We had great wind, bright sunshine and a lot of fun. 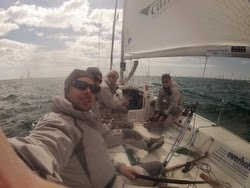 The campaign is awesome and the crew sailed hot for the upcoming season!” Learn more about the Campaign J/80 sailing team here. (Cleveland, OH)- After fabulous sailing the week before, the second part of Cleveland Race Week this coming weekend will have a hard act to follow. After enjoying sunny skies and good breeze, the sailors this weekend hope they escape the Midwest heat and lack of wind to enjoy the festivities on-shore as well as good sailing on Lake Erie. This Saturday and Sunday, Edgewater YC will be hosting their “offshore” version for PHRF handicap racing boats as well as the “Women’s” division. The PHRF divisions have 69 boats sailing, including 23 J/Teams (33.0% of the fleet!). PHRF Spinnaker Division has a large fleet of J’s participating, including two J/111’s (Don Hudak’s new CAPERS and Ryan Ruhlman’s championship team on SPACEMAN SPIFF), Tim Yanda’s J/120 VIVA LA VIDA, Seth Young’s J/39 BLACK SEAL, Mark Saffell’s J/36 PAINKILLER, Paul Matthews’s J/35 WHITEHAWK, Jay Hawkins new J/88 TY-LEE, Peter Kuhn’s J/33 WINDLASSIE, six J/105s (Rick Drucker’s KNOT GUILTY, Eric Sutherland’s ROLLICK, Bob Mock’s UNBRIDLED, Jim Uhlir’s TRIO, Jim Sminchak’s IT, and Chris Mallet’s SYNCHRONICITY), three J/29s (Cindy Einhouse’s OVATION, Kevin Holland’s BADFISH & Aarne Lillo’s AQUARIUS), John Sukis’s J/34 IOR SNEAK ATTACK, and two J/30s (Rich Galaska’s BREEZIN & Dale & Maggie Gormley’s SAND DOLLAR). Perhaps the most novel and certainly ground-breaking division that Cleveland Race Week has pioneered is the Women’s “double-handed” offshore sailing divisions. The rules are simply that at least one crew member is a woman. The fact that 12 of the 29 teams are J/Teams (41.0% of the women’s fleet) is not surprising. Fun, easy to sail boats are essential to women having fun sailing boats whether it’s cruising, day-sailing or racing. There are three divisions based on level of experience. 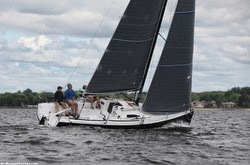 In the JAM-Double fleet is Chris Howell sailing with his wife on the J/22 LONDON FOG. 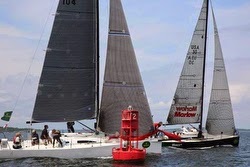 In the PHRF-Double Division is John Zelli sailing his J/22 FREE ENERGY with his significant other. Then, in the “all women” PHRF Women’s Division are Abigail Ruhlman and sister sailing the J/111 SPACEMAN SPIFF, Mindy Sminchak sailing the J/105 IT, then two J/70s being sailed by Elizabeth Wilder on REHAB and CC Skoch on USELESS, Cindy Einhouse sailing the J/20 OVATION, Linda Cutler sailing the J/24 CARRY-ON and Cheri Morabito skippering the J/22 WYSIWYG! 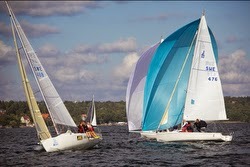 (Stockholm, Sweden)- The J/80s in Sweden have just started to get their summer going this past weekend. It’s well understood that living that far north in Scandinavia the sailing season is rather abbreviated, but much loved for many reasons! By June 21st, not too far away, it’s the Mid-Summer Celebration in Scandinavia and many sailing regattas abound that enable you to sail for 24 hours in pure sunlight (or at least in sunset to sunrise conditions) for most of the time. Quite spectacular for those who have not experienced 24 hour sunlight. The J/80s are well on their way in their 2014 sailing season, having counted the Lidingo-Runt, Viggan-Open and two races in their season series so far. Recently, the first J/80 endagarsregatta was sailed in “propaganda weather” with good winds and great racing. The fleet enjoyed six races in just over four hours! It was tight racing at its best, with few boat lengths distinguished between the boats after two laps. The winner was Johannes Bergh’s HAPPY, with Pontus Tornlund’s HEAVY DUTY in second and third was Lars Bellerhed’s MK-PRODUKTER. MK are training hard for the upcoming J/80 European Championships being sailed in Barcelona, Spain. In the second endagarsregatta on June 1st, the J/80s had another good weekend of racing. Again, Bergh’s HAPPY won the regatta. There was little wind at the beginning and three races are completed rapidly, before the sea breeze came and the track was moved to Fällström. 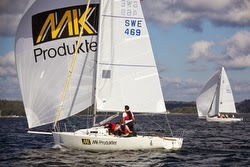 After the first two races, MK-PRODUKTER led the regatta in the light winds. But, when the sea breeze came in and the wind increased, it was good to have maximum weight to windward. Despite this kept MK finished second in the regatta. The winner was Happy, third was Tyra and four Parbleu. Join Summer Sailstice! Celebrate Sailing! Beckwith's FKA Da J/80 Jamboree Jammer! J/70 Danish Sailing League- A Game Changer! J/22 Crushes Delta Ditch Run Race! Danish J/70 Sailing League Commences! J/70 Midwinters @ Key West Race Week 2015! J/120 J-HAWKER Is Bayview One-Design Champ! J/24 Mermaid To The Rescue! AYC Youth Sailors Win Block Island Race!